We first heard about it on Wednesday: the Polish football supporters federation (OZSK) announced their own amendments to the existing, highly controversial, Polish ‘Mass Event Safety Act’. Our first impression, sorry to say, was rather stereotypical: legal pyrotechnics, safe standing approval, abolition of stadium banning orders and general liberalization. Having said that, it’s a pleasure to admit we were very wrong. Now, after reading the draft we can only apologise for the preconception. This grassroots version of the Mass Event Safety Act, designed by two recognized fan-lawyers Dr Mateusz Dróżdż and Przemysław Plewiński, is simply better than what Poland has in place now. On many levels! As you may recall, last year’s amendment of the law officially waived the decade-long ban of standing spaces inside Polish stadiums. At least in theory, because the MPs insisted that one seat could only be transformed into one standing place. This proved economically unviable for the clubs and cities operating stadiums, because standing tickets are cheaper. So, following the path of nearby Germany, the fans’ version opts for a 2 to 1 transition, meaning two standing places instead of one seat. It’s a proven and safe solution, though authors agree additional rules need to be added to existing building code in order to make sure all stadia would meet safety regulations. Also, the ratio of standing to seating could only reach 25% of total capacity. 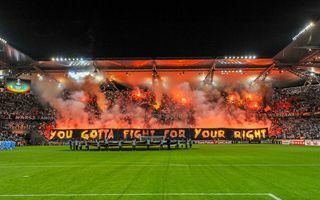 While Dr Dróżdż agrees current Polish law is too strict on pyrotechnics use (up to a few years in prison), the new one should not become the opposite extreme, where nothing is forbidden. A compromise might resemble the solutions currently in place in Austria. There, a very strict legislation is in place, also very controversial, but exemptions can be made with the use of internal regulations. In Poland this would mean simply working with fans to deliver safe and acceptable good practices, still leaving space for creativity and spontaneity in the stands. Under current law, Polish football clubs can impose a ban on individual fans on a vague basis. The fan then cannot appeal such ban to anyone else but the club which issued it. This piece of the legislation was highly criticized by lawyers, even partly abolished by the Constitutional Court in 2014. Now the fans want to get rid of it, mainly because since 2009 it hasn’t worked, being used by football clubs against fans who protested in the stands rather than to tackle actual hooliganism. The courts would of course still impose banning orders, but on a much more rational basis than today. At present the court is obliged to include banning orders in almost every instance, even when law violation is minor and in no way threatening to the game’s safety. Meanwhile the same violation outside the stadium would result in a ticket in the worst case. That’s why, not to flood the courts with minor offences, fans propose leaving these to police officers and security personnel on site. If a violation is serious, fans would still stand trial and face even prison time. Especially if a crime would be committed against the health of security personnel, who currently are considered under-protected by law. Also, the security officers’ duties and competences would be simplified and codified better to avoid confusion during games. The story behind alcohol in Polish stadiums is a rather funny one. Back in 2009 the supporters, including OZSK, the organisation behind the latest bill, were strongly against introducing beer into the arenas. It was actually UEFA who pushed for the beverage ahead of Euro 2012 due to their partnership with a beer brand. Fans still aren’t opting for more alcohol. But event organisers are, for a practical reason: current law says beer with only up to 3.5% alcohol level can be sold. But there’s very poor choice of such beers in Poland, which is why the new legislation plan would allow to choose beers with up to 6.5%. Then there’s the issue of VIP and corporate hospitality areas. Under current law people drinking alcohol there are either breaking the law or are considered… outside of the event site though still being inside the stadium. Not only for drinking, the same goes for using cutlery, which is illegal! That’s why the fans’ project simply includes a provision that organisers can include any alcohol allowed in Poland for corporate guests and VIP’s. Because why not? And yes, cutlery too! Current Mass Event Safety Act has many irrational provisions which, when read literally, lead to amusing results. For example, the definition of football leagues covered by the bill is so vague, that even futsal leagues have to provide compatible CCTV and identification systems. Which they cannot cope with. That’s why Dróżdż and Plewiński together found and removed well over 100 errors or loopholes (!) from the bill in their project. Overall direction is: making it more simple and clear for all parties included, while not risking actual decrease in safety. The proposed new bill is already being evaluated by the parliamentary commission, with Polish football governing bodies understood to have supported it. If the legislation is voted upon and passed, it might be (to our limited knowledge at this point) the first case internationally in which supporters wrote the law governing their own safety!